Pulpitis is an inflammation of a neurovascular bundle (pulp) which is located inside the tooth. Intense tooth pains at nighttime and shooting pain, which appears under the impact of such external stimuli as heat and cold, are the most common symptoms of pulpitis. At the iStomatolog center, we use the most modern equipment for endodontic treatment of root canals from the world-leading manufacturers, such as MicroMega, Parkell, Kavo, Morita. 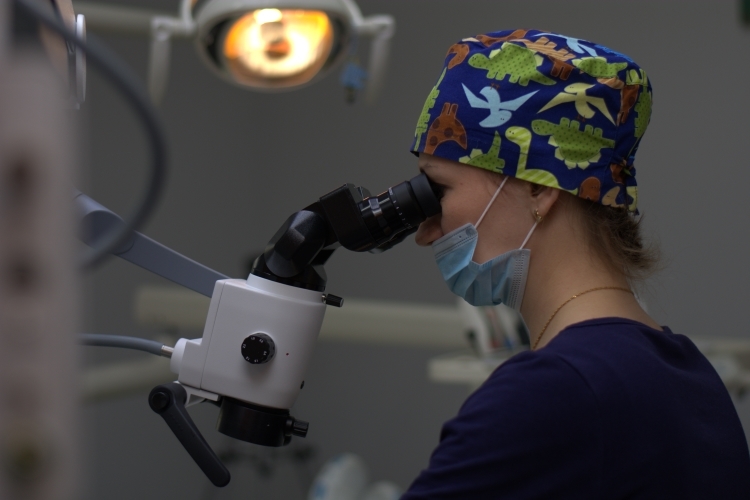 It allows us to carry out a full mechanical and medicamental treatment of root canals is just one session and to prepare them for the next stage which includes filling the root canals with endodontic pastes. The pain can cause an echo in the teeth of the other jaw, the ear, or under the lower jaw. In the case of a purulent inflammation, the patient experiences pain relief from cold food and the sharp increase of pain from hot food. The presence of carious cavity is not necessary; on the outside, the tooth may seem unaffected by caries. Installation of a temporary filling. What will happen if pulpitis is left untreated? Oftentimes, we do not have time or opportunity (the usual fear is also a factor) to make an appointment with dentist even if we experience tooth pain. We take painkillers, try various natural home remedies, and heed all those “tested and 100% working” recommendations from friends and relatives. In a best-case scenario, they will not work; the effect of painkiller will fade and the visit to the dentist will become inevitable. Unfortunately, we often witness the worst scenario, when the tooth pain passes off. Believe us, it happens not due to the miraculous effect of garlic or a cotton ball, soaked in bee glue or an extract of pumpkin tails which you applied on a tooth cavity or gums; not the application of fatback or a tampon with paracetamol, not the Glister toothpaste, or even a pepper vodka. It is just a sign that the inflammation is transitioning to a new level. The so-called “temporary relief” signifies that the pulpitis is transforming into periodontitis (inflammation of the bone which surrounds the root) or a chronic inflammation of the tooth nerve. The crooked or sclerous (narrowed) root canals are treated and filled under the microscope. It is absolutely NORMAL, if after the treatment you feel minor pain in a quiescent state or when putting pressure on the tooth. In case if there is a purulent or even gangrenous process in the root canals (sharp bursting pain and odor from root canals), the filling cannot be completed in one session. In such cases, we use a special medical liner to stop the purulent/gangrenous process which will continue in the tooth tissues under the temporary filling. In some cases, the tooth may be felt open for a few days and the soda baths can be prescribed. You can get an accurate evaluation of the cost of pulpit treatment, in other words, filling of root canals with the subsequent tooth restoration, during a free consultation at the iStomatolog center, after the initial checkup, diagnosis, and X-ray examination. Our doctors will make a detailed treatment plan, from nerve removal to tooth restoration, and let you know the exact cost of all stages of treatment.